The GT4 Challenge is made up of gentleman drivers who race head-to-head in Aston Martin V8 Vantage GT4s with 445 bhp engines, paddle-shift transmissions and the aero kit. The cars are powerful and easy to drive with a 50:50 weight balance and driver aids such as race developed ABS and traction control. There are many opportunities to become part of the Challenge from entering your own V8 Vantage GT4, running an arrive & drive programme with an established race team or by completing the Aston Martin Racing Driver Training Programme to gain your racing licence and compete in your first event. The GT4 Challenge has a compact schedule with optional testing available at most circuits the day before the race. Events follow an endurance format with two drivers sharing a car. Races include mandatory pit stops for drivers to swap and teams to change tyres and refuel. Qualifying is followed by a variety of race lengths from 60 minutes to 100 minutes. Aston Martin Racing offer a unique programme, which trains complete novices to become racing drivers. The initial assessment takes place at a private test facility followed by training in a specially developed GT race car simulator. Once the basic skills have been mastered the next step is to drive an Aston Martin V8 Vantage GT4 at a UK race circuit with expert tuition from an Aston Martin Racing instructor. You are then coached to pass the ARDS test to gain a National B race licence. The last stage of the programme is to take part in an Aston Martin GT4 Challenge test day and race. If you own a V8 Vantage GT4, teams offer a service to run the car for you on event or manage your car completely to include transport, servicing and storage. Costs for this service can include a full service or simply running the car for you on event. Teams can also offer garage space if you require an awning on event. 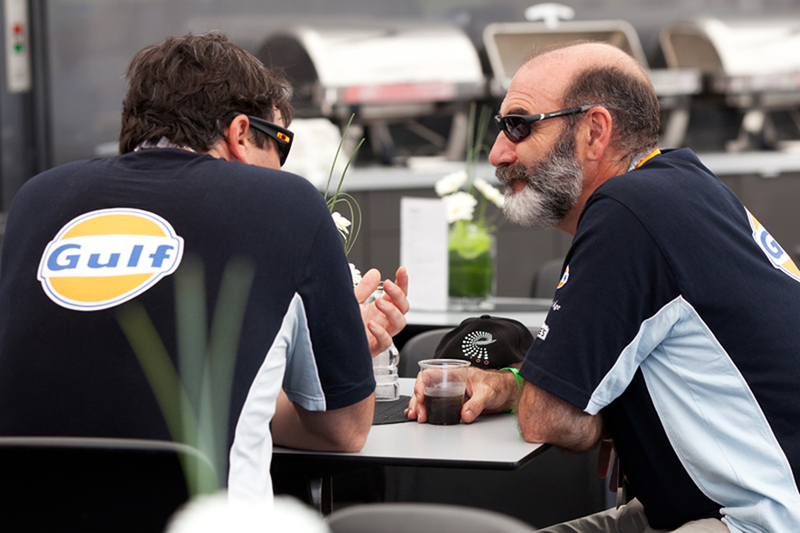 All entrants receive four passes to team hospitality for breakfast and lunch. Guests will have tours of British GT* and GT4 Challenge garages, talk with teams and drivers, sit in the V12 Vantage GT3* and V8 Vantage GT4 race cars. At British GT rounds, there is a dedicated display of luxury cars, classic cars and supercars. The display is the perfect opportunity to admire some of the finest production cars available alongside their racing equivalents. Alternatively, you can enter on a per race basis. If you are running a full arrive and drive programme at £9,000 + vat per driver per race, this fee includes race entry fees.